Welcome to CPCC Today! An online community and weekly e-newsletter for Central Piedmont students. 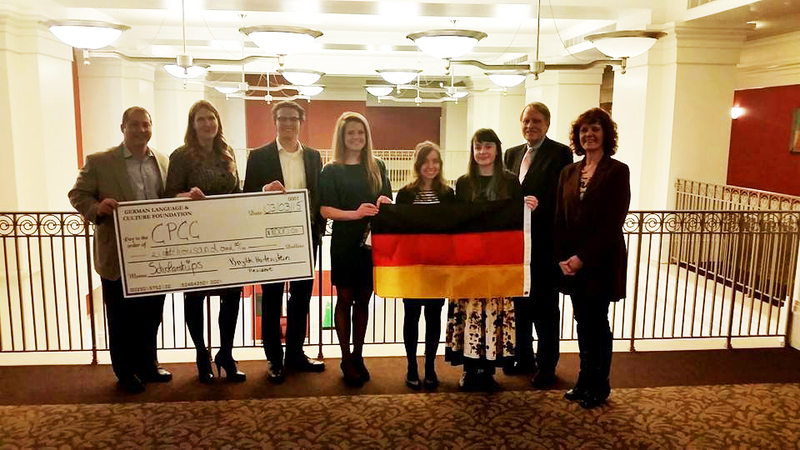 On March 3, CPCC students Margaret Dugger, Frederic Hoeffler, Cheyenne Jarrell and Madison Kaiser were named the 2015 German Language & Culture Foundation Scholarship recipients. 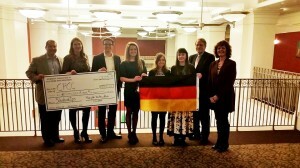 Each student will receive a $2,000 scholarship will pay for their study abroad trip to Germany this June. The gift to the college reinforces the GLCF’s commitment to supporting projects that help create long-term friendships and promote a better understanding between the people of German-speaking countries and the Charlotte metro region. Charlotte is a mecca for German-based business operations; the Queen City’s German companies employ more than 15,000 people across the region. At the ceremony the students received congratulations from the president of the German Language and Culture Foundation, Brigitte Hartenstein and sponsors from the companies K&L Gates, Weima, ParkerPoe, and Leser LLC. This entry was posted in Community and tagged GErman Language & Culture Foundation Scholarship, Germany, scholarships, study abroad by Mallory Benz. Bookmark the permalink.